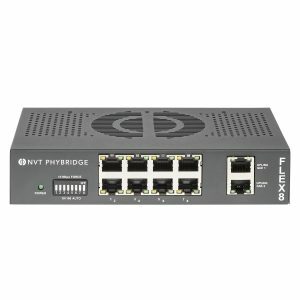 The NVT Phybridge FLEX8 plug-and-play long reach PoE Switch is a versatile, high-powered, enterprise-class solution with 8 downlink ports delivering fast Ethernet (10/100Mbps full duplex, symmetrical) and PoE++ (50Wper port) over multi-pair UTP for up to 2,000ft (610m) – that’s 6Xs the distance of typical PoE switches. 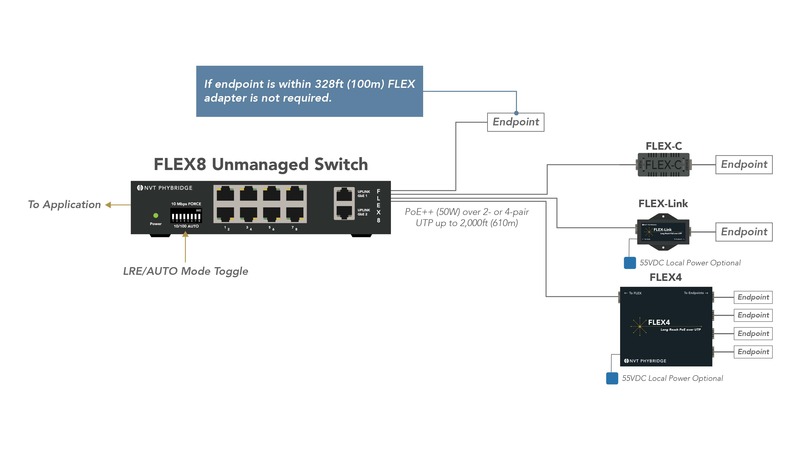 The FLEX8 switch has two 1Gb uplink ports for daisy chain deployments and comes standard with a 190W external power supply and a universal mounting kit for wall or rack mounting. The FLEX8 switch leverages new or existing 1, 2 or 4 pair UTP cable. It can operate in standard mode (without an adapter) up to 328ft (100m), and in long reach PoE mode (with an adapter) for extended reach to 2,000ft (610m). The FLEX8 switch auto detects data rate for maximum bandwidth and transmission distance. It is equipped with a mode toggle which can be positioned to force 10Mbps when necessary to establishing a link. 8 port plug-and-play unmanaged switch delivering fast Ethernet and PoE++ (up to 50W) over multi-pair UTP with up to 2,000ft (610m) reach. 8 x 10/100Mbps (symmetrical, fullduplex) downlink ports supporting up to 50W of power per port. Mode toggle to force 10Mbps speed when necessary to establish a link. NV-PS55-190W 55VDC 3.5A (190 Watts) power supply for the FLEX8 switch. NV-PS55-190W-DC 55VDC 3.5 (190 Watts) power supply for the FLEX8 switch to be used in Railway and Subway applications. Customer Testimonial – Managers Perspective. Customer Testimonial – Operators Perspective. Customer Testimonial – Providers Perspective. Customer Testimonial – Wagner College modernizes to IP in a single weekend saving money, eliminating risk and costs. The FLEX-Link can support up to 50W of power using all 4-pairs or maximum of 30W using 2-pairs. FLEX4 can accept up to 120W of power and it can output up to 30W of power for 802.3af/at compliant devices. To account for cable losses and increase PoE delivery, the FLEX-Link/FLEX4 adapters have the option of using a local external power supply. The FLEX-Link/FLEX4 are IEEE-compliant and will negotiate power with the IP device. The FLEX-C supports IEEE-compliant devices and can support up to 30W of power. If additional power is required use FLEX-Link instead.